My twin bento is actually an identical bento for the kids. So they always get exactly a same bento. Of course I don't always buy the same bento boxes for them but I have some bento boxes, same size and shape, only different in color. As you can see from the picture, my girl took the pink 2-tiers box and the boy took the yellow one. I love to use same bento boxes for them because it saved me a lot of time to put everything inside. Basically just copy and 'paste' from one to the other box :) Big A seems ok this morning, still have a little cough but I think she can do her swimming test very well. I made these simple rabbits with rabbit head shaped cutter and clover cutter. 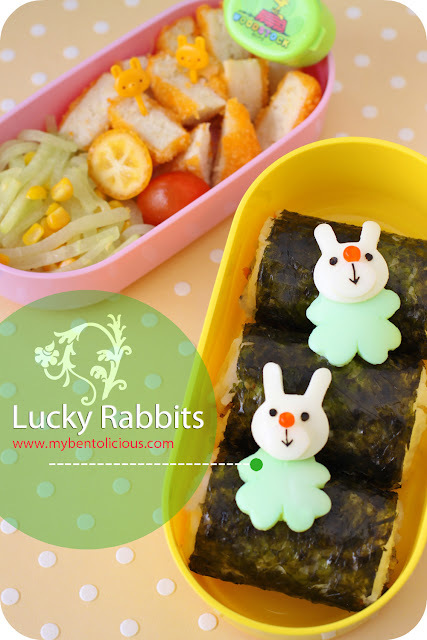 As clover means lucky leaf, so these rabbits are lucky rabbits. I hope they bring luck to Big A. I ran out fish ball and kamaboko, so I used hard boiled egg to make the rabbit. Just punched the cutter on the hard boiled egg and for the clover just soaked them in water with green food coloring. Linked this bento to What's For Lunch Wednesday. I bought Hippomum's new bento book. I love this book! You can check on her blog chaRa-beN workout and the book can be ordered online from the book store here. Her bento book contains 141 pages written in Chinese which give me so much benefit because I can read it. A lot of tips and step-by-step pictures, so don't worry if you can't read Chinese. The pictures are pretty clear to tell you how to make the kyaraben bento. She is one of the creative & talented bento moms and she is very neat for every details in her bento making. Some recipes are available too at the back. The rabbits are so cute, Lia! What did you use for the nose, is it mini jelly? Where can i buy it? Lia, these are too cute! F would love them (we just saw the movie Hop last weekend and she got to do bunny pics for Easter, so she's on a bunny kick). @Shannon : Thanks a lot Shannon! My kids haven't saw Hop movie yet. Will go to watch soon :) BTW, you just remind me that Easter is coming soon. I'm glad to hear Big A is feeling OK! I love the bunnies, the colors are amazing! So happy to know big A is not that sick today. Hope she keeps well after the swimming session! I just have to know how you managed to keep you bentos neat and tidy when the kids unpack them? Mine seems to get squished, the lid wont close due to the food pids, or the salad and decoratove grass gets bended and ruind. How do you awoid that? The two bunnies are so adorable...!! I hope my nori punchers are going to arrive soon, I have been waiting for ages :(. What a great idea to make two the same. Do they have the same size appetite? And that way you only have to put the one picture. So cute the clover! Love the bunnies. @Mommyof2girlz : Thanks a lot Stephanie! Love the sweet clover bunnies! 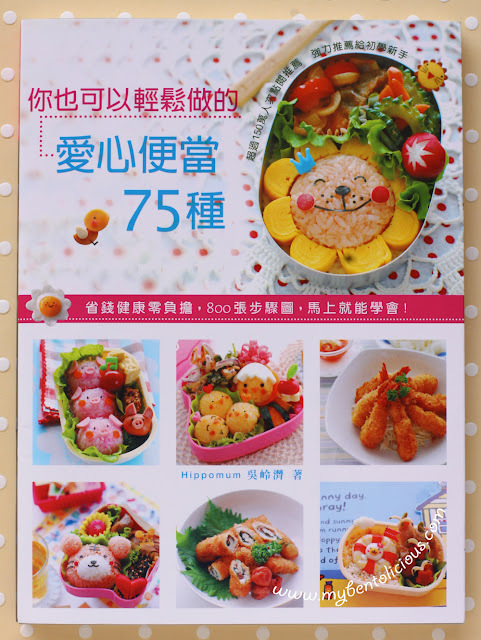 Thanks for the info about HippoMum's book, she's such a talented and kawaii bento artist. @Angeleyes : What happened? Error on my blog?